Both congratulations and thank you are in order to the participants of the Highland Woods WLGO Wounded Warrior Golf Outing! Our total contribution to the Wounded Warrior Project this year was $12,865!!! Every participant should be exceptionally proud as you have continued to grow the event each year Highland Woods has hosted it. It is simply not a success without the help of our fans. 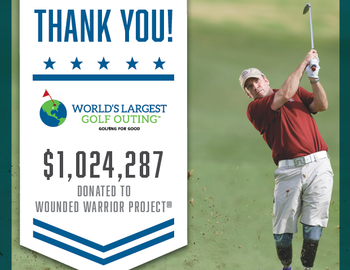 The WLGO Team started 2015 with the goal of raising $1 Million Dollars for the Wounded Warrior Project. Thankfully, the WLGO Team had the backing of over 12,000 golfers nation-wide to make this happen. From cupcakes to toy tanks, contributors from all over the Chicagoland area pitched in and made August 3rd, 2015 a day to remember. Thank you.